If you wish to skip the typical, more well-known resorts in Majorca and are looking for somewhere more relaxed and authentic, Valldemossa is the right place for you. 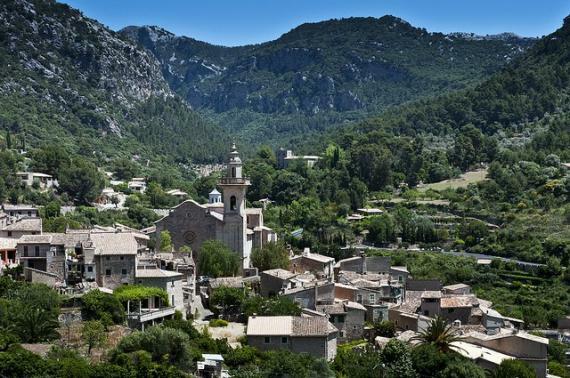 Located just 17km from the capital city of Palma and 435 metres above sea level, Valldemossa is a stunning town in the heart of the Tramuntana mountain range that has a lot to offer its visitors. A large number of artists have been living in Valldemossa, as they are so attracted by its powerful atmosphere. The great musician Fréderic Chopin has to be mentioned; Chopin spent 3 months in Valldemossa together with his partner George Sand (Aurore Dupin). The pianist composed his Preludes and other pieces here, and George Sand wrote 'A Winter in Majorca'. In Valldemossa people can visit the Real Cartuja, an old monastery founded by monks where Chopin and George Sand lived during the winter of 1838-1839. In this museum, there are souvenirs of the romantic couple and interesting pieces of art on display that date from the 15th to the 20th Century. Every August in Valldemossa, visitors can join the locals in celebrating the Chopin Festival, where a lot of famous musicians have played every year since 1930. After visitors have had a taste of Valldemossa's cultural scene, it's time to relax. You can enjoy walking through the streets of this incredible town, taking in the unique atmosphere and enjoying the fantastic views. For this purpose, there are two viewpoints that will really take your breath away. One of them is the Mirador del Puig de Sa Moneda, which is a viewpoint that was created by the archduke Lluis Salvador. It's situated about 3.5km from the town centre, and from here there are one-in-a-million views of both the coast and the town of Valldemossa itself. Another fantastic viewpoint is the Mirador de Miranda des Lladoner, which is located close to the Real Cartuja. From here, visitors can enjoy the views of Valldemossa, the valley and even the catch a good glimpse of Palma in the distance. You can not leave Valldemossa without tasting its typical bread roll called Coca de Patata. There is outdoor seating in all of the terraces and bars, which are perfect locations to enjoy this incredible pastry. It's usually eaten with a cup of coffee or a mug of hot chocolate, and can be purchased at one of the local bakeries. Accessing Valldemossa is quite easy for those visiting for the first time. You can get here via public transport from Palma's main bus station, or you can come by car, which is not a bad idea, as Valldemossa has lots of public parking available. Find information about selected Hotels, apartments and rooms in Valldemossa to choose the perfect place for your accommodation.